The USDA’s volume data is one of the most complete representations of a market available everywhere – not only considering imports to the U.S., but national production to a large extent as well. 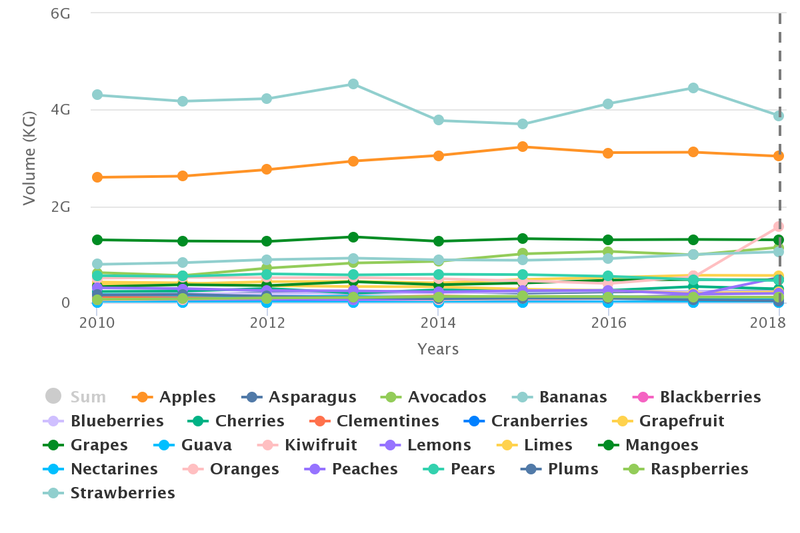 In 2018 we also saw a big improvement to the data set, which now offers more complete information for several commodities (mostly citrus), which used to only partially include U.S. production. In the table below we can see the ranking of commodities by percentage of growth, which offers some good insights when considering the commercialization of the fruit the data set is trying to represent. By far the biggest increase in volume is for lemons and oranges, both of which saw huge jumps compared to the previous year. Avocados and grapefruit saw much more moderate yet still impressive growth. This might be a good time to mention the new data that the USDA has begun reporting for certain commodities. 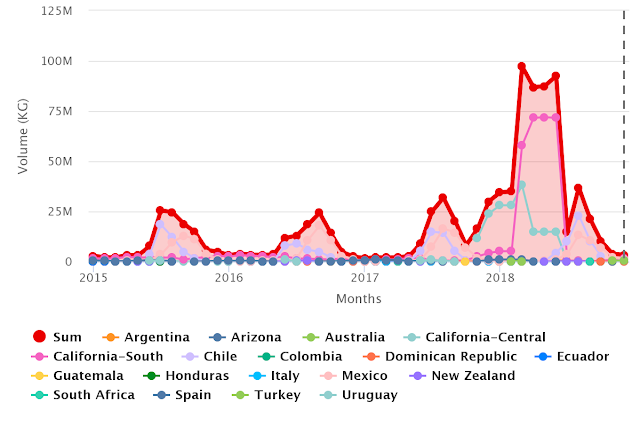 At the end of this article I put the chart of lemon volumes by origin where you can very clearly see the new volumes that are being reported, Keep in mind that this is not new volume – California has produced lemons for as far back as we have had data, but the volumes just weren’t being reported. 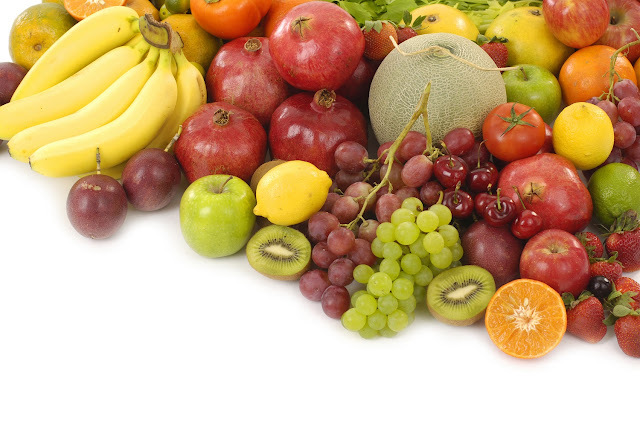 This being the case, it is very difficult to make a level comparison of the commodities with the new reports to others so I put an asterisk next to all the fruit that is reporting new volumes that might create a problem in this analysis. In bold, the commodity “All” represents the average growth for all the products we have in Agronometrics, which shows that volumes, as a whole, grew by 6.02% in 2018. This includes lemons and oranges, but is still an impressive level of growth. To read this chart, keep in mind that 100% equals the same volume as last year, where anything above is growth and anything below is a loss. Just like when we were looking at prices, seeing the massive amount of year-to-year variance it is reasonable to say that yearly percentage growth might not be the best indicator of overall attractiveness of a commodity. In agriculture, this is particularly true, given that planting new crops requires longer investment periods to begin seeing returns, so I expanded the study to observe average yearly growth for the last eight years. As a point of reference, I offer the same calculation for 2017 as well. The biggest winner, even looking back eight years from 2017, continues to be lemons. Although this it is a calculation made with incomplete data, it does say that at least other non-U.S. origins are seeing a lot of growth. Of the other categories that haven’t been affected by new data, guava and avocados stand out. Readers of our previous article might find that the information in this chart contrasts with the previous one in which we covered prices. Especially when looking at commodities like avocados, which saw huge losses in price contrasted with record levels of growth. This scenario sets us up perfectly for our next article where we compare prices and volumes to see which markets could be considered more attractive across these two complementary datasets. In the graph below you will find our example of the new data that the USDA is reporting.